A common question for consumers completing a tax return is whether or not gambling winnings are taxable, and how such winnings would be reported on the return. In most all circumstances, money won from gambling is fully taxable and must be reported on tax returns. Are you reporting your gambling winnings and losses to the IRS? In fact, sometimes the payer of gambling winnings might provide a Form W-2G and have federal income taxes withheld from the winnings. Gambling income ranges from lottery winnings, raffle, horse and dog races and casinos. The people that win on “The Price is Right” will probably face some hefty taxes as well, as cars, houses, trips and other noncash prizes are usually taxed at their fair market value. The full amount of gambling winnings must be reported on Form 1040, line 21, regardless of the amount of whether the payer provided a W-2G form. 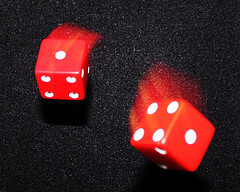 Gamblers may also be able to deduct their losses if they are not more than winnings. Keeping receipts and other statements documenting winnings and losses is important, as they are required by the IRS. Free tax software like TaxACT can help taxpayers navigate through the confusing federal and state tax codes so that returns are guaranteed accurate. This entry is for information only and does not constitute tax advice, nor does it serve as legal advice. There is no intent to create, nor does this blog site constitute, a professional tax practitioner/client relationship. You need to consult with your tax professional prior to acting on any item of information you learn on this site. Tax laws change from time to time, and are different in various locations. I need help/info.. I recently received a letter from the IRS stating that I won $2380.00 at Harrah’s in Indiana in 2005. This is in 2009 that I got this letter. I called and got a win loss statement. Well they combined your win/loss and it states that I won 2122.00 ,which is CRAP… I have lost a fortune at that place. I don’t even recall the winnings from 2005 unless the added all the little here and there wins. But I didn’t hit any kind of Jackpot.